With the eCommerce market value to reach $6.7 Trillion by 2020, lot many eye-balls have been turning in the direction for quite sometime now. With the Indian eCommerce market alone to be valued at $20 Billion at the end of 2015 ($2 Trillion globally), the stakes are high as never before. The dynamics of Social Commerce (eCommerce and Social Media) are ever changing. Some of the trends of 2014 would be carried over to 2015 whereas some have been archived due to their saturation. Following is my presentation and a short write-up on it from my session at KMM College of Management Studies, as part of their “National Seminar on Emerging Trends in eCommerce”. Social Commerce can be defined as the relation and impact of Social Media on eCommerce – user engagement and interaction over social media channels to support in online buying and selling of products/services. The flirtation between Social Media and eCommerce has been going on for quite sometime, but hasn’t resulted into a committed relationship yet. In a survey conducted by CMO on 351 eMarketers, only 15% could prove that Social Media has had quantitative impact on their eCommerce initiatives, while 45% mentioned no impact and 40% voted for qualitative impact. Though these numbers would be growing in the coming years, it does show the immaturity with which many marketers approach Social Commerce. Social is a means to make shopping better. Not vice versa. One cannot mix social and shopping on the same level. Social Media is used by the audience for engagement & interaction and anything which moves them away from this experience is just noise. 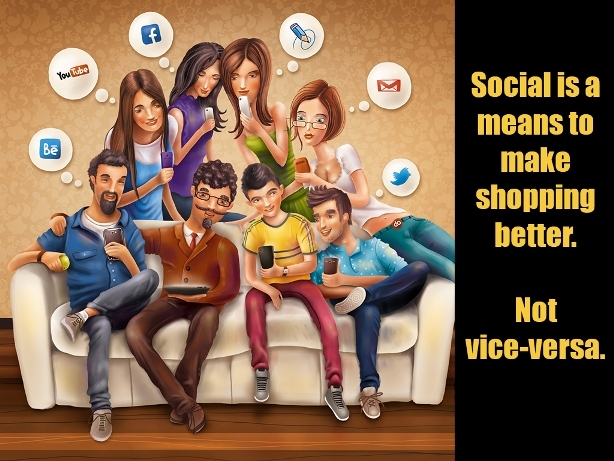 Hence, rather than pushing Shopping into Social, marketers ought to learn to integrate the Social aspects into the Shopping experience. Reciprocity – When a brand gives something of value to the user (either in kind or even as content that engages the user), it imbibes a reaction from the user to have a psychological preference towards the brand. Thus, the brand builds a brand advocate. Community – It is the basic nature of humans to associate in communities with similar beliefs and preferences. This is exactly why brands focus on building a community of users who might influence others around them. Social Proof – Word of mouth and recommendations from others plays a very integral role in deciding our buying trends. Reviews from other users on eCommerce sites forms a major part of this Social Proof. Authority – The above mentioned Social Proof brings in a sense of authority for the buyer in us to take an authoritative decision on the buying process. Scarcity – Announcing that a product is available in scarcity, or at discounted rates for a short amount of time, might take its value up to new heights – similar to what Apple does with its releases. This has become a new trend in eCommerce as can be seen with various examples like Flipkart’s Big Billion Day Sale, Google’s Great Online Shopping Festival etc. In the real live world, conversations happen at the marketplace, whereas in the online realm, market is where the conversation happens. That is why we see marketers and organizations spend millions of dollars in tapping into the online conversations about their brand/product. Social Network driven sales – e.g. Facebook Commerce, Twitter Commerce etc. Peer-to-Peer sales platforms – where the eCommerce site acts as the platform for connection between the seller and the buyer. e.g. eBay, Amazon etc. Group Buying – where products/services are sold or discounts given only after a set number of users claim the offer e.g. Groupon. Participatory Commerce – where users get involved in the production process. Mainly classifies crowd-funding sites e.g. Indiegogo, Kickstarter etc. Mobile first World – It already was in 2014 and will continue to be in 2015. Content Marketing evolves – enough said! 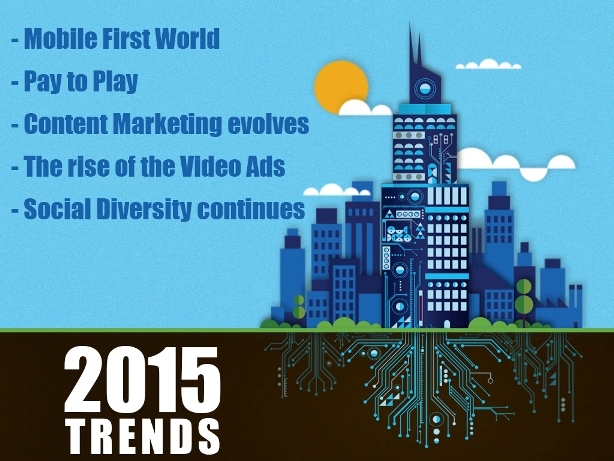 The rise of Video Ads – if 2014 was the year of video, 2015 will be the year of video ads. Maybe we can get the clue from Facebook releasing its Video Ads on a larger scale later this year. Social Diversity continues – If Google and Facebook took the big bucks of advertisement in 2013 and Pinterest, Twitter & Linkedin swung into into that share in 2014, 2015 might just see a whole lot of diversity rise up!